After a while, the windshield wipers on a Jeep Cherokee will develop slack and begin to hit the windshield trim. The Jeep dealer will tell you that you have to replace the entire wiper mechanism. However, the wear is just in the little plastic bushings. With a little know how and some simple hand tools, you can have your wipers working properly again for just a few dollars in bushings. The bushings you need are available from most auto parts stores who carry the HELP brand. You have to buy a whole pack of wiper bushings to get the three you need. Begin by removing the wiper arms. There is a small tab near the base of the arm. Pull out on the tab and you can then remove the wiper arm from the splined drive. Next, remove the several Phillips head screws that hold the cowl cover to the Jeep. Carefully lift the cover up until you can reach the windshield washer hoses. Pull both of these off and then set the cowl cover aside. Remove the four torx head bolts that hold the wiper mechanism to the Jeep. These are T30 torx. Then, remove the bolt that holds the drive motor to the Jeep. It has a 13mm head. Disconnect the wiring harness from the drive motor. Drop the splined parts through the cowl and then work the whole assembly away from the center of the Jeep into the cavity in the fender. Rotate the mechanism so that you can lift it up and out of the access hole. Locate the three plastic bushings in the linkage. Check them for slop. On mine, only the one at the drive motor was worn excessively. Mark the linkage so that you can put it back the way it was. Use a pry bar to separate the bushing from the pivot ball. Place the bushing over a receiving cup. I used a large socket. Tap it with a hammer to remove it from the linkage. Flip the link over and drive in the new bushing in a similar manner. Make sure the tabs are aligned with the slots in the link. If the pivot balls are rusty, clean them before reassembly. I also added a dab of grease, but that is not required. Press the ball into the bushing. Repeat the process for the other two bushings as needed. Slip the mechanism into the cavity in the fender and rotate it back into position. Start the drive motor bolt, but do not tighten it. Make sure that the wires and washer hoses are not trapped below the linkage. Install the four torx bolts that hold the mechanism to the cowl. Once all four are started, tighten them all down. Then, complete tightening down the drive motor bolt. Reconnect the wiring harness. Connect the two washer hoses to the cowl cover. Replace the cowl cover and screws. Slip the wiper arms back onto the splined drives and set the clips. Spray some water on the windshield and test the wiper operation. Make sure the travel is correct and that there is no binding. If the wipers do not park in the proper position, remove them from the spines and reset them to the correct position. Janice’s Jeep was making a roaring noise from the rear end. After just a short test drive, the pinion on her Dana 35 was much warmer than the rest of the axle. Listening with a stethoscope confirmed that the pinion bearing was noisy. I tried just changing the outer bearing and seal but since the race was worn was well, I had to disassemble the differential and change both the pinion bearings. I ordered a Pinion bearing kit from Crown Automotive. This kit came with bearings, a new crush sleeve, shims and a reusable gasket. I removed the wheels, and brake drums. Then I removed the cover and drained the fluid. Next I removed the carrier. I was careful to keep the bearing races and shims in the proper order. I noticed that the bearing caps were marked with and X to keep them on the correct sides. One X was vertical and one was on its side. I dropped the drive shaft and removed the pinion nut. I used a dead blow hammer to knock the pinion out of the front bearing. I then used a pry bar to remove the pinion seal. I used a chisel to tap out the two bearing races. I used a soft punch to drive the in the new bearing races. I used a bearing separator and hydraulic press to remove the inner bearing from the pinion. I ended up breaking the bearing race while pulling it off, so I was glad I was not trying to reuse it. I reused the shim under the bearing. I used my heat gun to warm the bearing and then slipped it onto the pinion shaft. I installed the new crush sleeve on the pinion as well. Next, I cooled the pinion in the freezer for a while before slipping it in to the housing and placing a warmed outer bearing on the shaft. I installed the seal and yoke and then tightened the pinion nut until the preload on the bearing was about 15 inch pounds. To check the preload, I had to use several adapters to get from the ¼ inch drive of my torque wrench to the ½ inch drive of the socket. With the preload set, I reinstalled the carrier. I used a dead blow hammer to tap the bearings into place. I reinstalled the caps making sure they were turned the right way round and they were on the correct sides. I slipper the axle shafts back in place and re secured the C clips. I then reinstalled the center pin set screw. I put the cover back in place using the reusable gasket from the kit. I put some silicone on the cover to glue the gasket to it and cleaned the housing well. I put the bolts back in and tightened them evenly. I filled the housing with gear oil and the Limited Slip friction modifier compound. I reinstalled the brake drums and wheels before taking it for a test drive. It was much quieter and the pinion did not heat up as before. My old exhaust was crumbling apart. The tip had fallen off behind the holder and the muffler had a huge crack in the bottom. It rattled and rumbled. I ordered the Dynomax system from Summit Racing through their Ebay store. It arrived in just a couple of days after I ordered. I had to laugh at the UPS man struggling with the huge box coming in my office door. I began by lifting my Jeep and using a reciprocating saw to cut the muffler loose from the catalytic converter. There were a lot of old welds here so it was pretty messy. I cut the muffler to get room to work to clean it up. The clamp at the rear hanger broke when I tried to unbolt it. I just twisted it out of the way. With both ends loose I was able to remove the muffler and tail pie as a unit from over the axle. I used a variety of metal working tools to clean up the end of the cat. I cut off the bulk of the old pipes and weld beads with a torch. Then I used a 7 inch grinder to clean up the slag. I finished with my 4 ½ inch grinder fitted with a flap disk. When I finished the reducer include in the kit slipped smoothly and snugly into place on the cat. There was a small hole in the pipe coming out of the cat so I elected to weld this joint closed rather than use the included clamp. Next I slipped the muffler into place. I supported it on a stand while I fit up the tail pipe. It took some wiggling to get the tip to line up where I wanted it between the spring and the trailer hitch. When I finally got it in place I used a ratchet strap to hold it in position while I put a tack weld between the muffler and the tail pipe. To get the rubber donut to connect properly with the hanger welded to the tail pipe, I removed the two bots that hold the hanger to the body. Then I slipped the donut over the hanger on the pipe and then I reattached the hanger using the bolts. This seemed easier than wrestling with the heavy rubber, which was cold and inflexible. I then tightened the clamp on the rear hanger making sure the pipe was still positioned where I wanted it. I then installed the clamps at each end of the muffler. I rotated them so that the base of the clamp would face to the side. This gives maximum ground clearance and protects the ends of the bolts from damage. With all the clamps in place, I removed the support and gave it a good shake to make sure it was positioned where I wanted it. I then lowed the Jeep and started the engine. I raised it back up and checked for leaks. Finding none, I was ready for a test drive. The Dynomax system has a nice throaty rumble without being loud. I am very happy to have my exhaust gasses exiting from behind the Jeep again instead of from underneath. 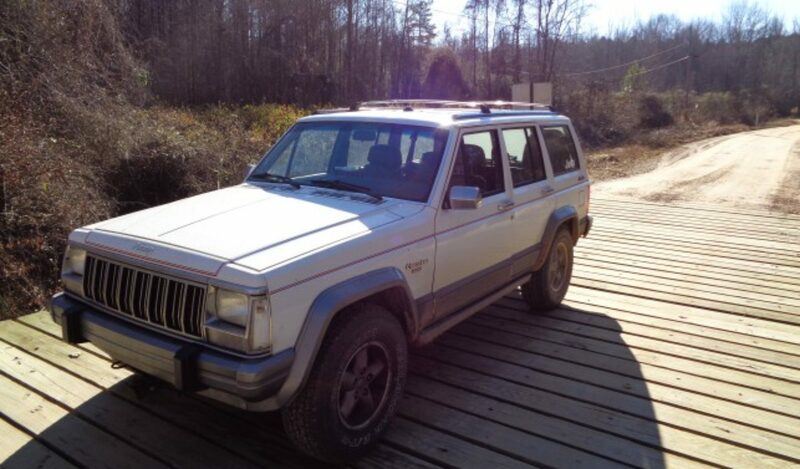 Janice’s 1999 Jeep Cherokee has had a roar in the rear axel for a while now. I finally got around to checking on last week. I ordered new bearings and seals from Crown Automotive. Since her rear differential is the Jeep Trac Loc, I had to have the friction modifier compound for the grease. I found that at Advance Auto. I began by lifting the Jeep and removing the rear wheels and brake drums. These had never been off and still had the little clips from the assembly line on two of the lugs. I cut those off with dikes. Next I let Janice remove the cover. Janice dropped it in the bucket of grease that made quite a mess. Next I used a 1/4 inch 12 point box end wrench to remove the bolt from the cross pin. I had been concerned that pulling the axles on a Trac Loc diff would be more difficult but it was exactly the same as any other stock Jeep Carrier. I just removed the pin and slipped in the axle to release the C clip. I removed the left side axle first as it seemed the noisiest. I had a little trouble getting the seal out because the brake shoes were in the way of getting a chisel in like I wanted to. But using a combination of the chisel, vise grips and a seal puller, I eventually popped it out. I then used an axle bearing puller attachment on my slide hammer to pull the bearing. It takes quite an impact on the slide hammer to get the bearing to move. I have done this job on other Jeeps so I knew to hit it hard. The bearing came out smoothly once it stated to move. The new bearing seems a very tight fit. I had trouble getting it to start straight in the axle tube. I did not have a bearing driver quite the right size and in trying different ones I somehow damaged the bearing. I noticed some of the rollers missing when I got it in place. So I had to use the slide hammer and pull the new damaged bearing. I was more careful with the second bearing and got it in with no problem. I put a small amount of Permatex on the outside of the seal and drove it in place. I put a little gear oil on the seal to prelube it. As I was wiping down the axle shaft to reinstall it, I noticed that there was checking in the bearing race on the shaft. Shaft will have to be replaced. I checked for spares but the only one I had was from a ZJ and the ABS tone ring was different. I replaced the original shaft temporarily. I slipped it in place and reattached the C clip. I pulled the other shaft and noticed it had some wear as well. I will have to get two replacement shafts along with another bearing to complete the job. I reinstalled the other axle and C clip and coated the cover flange with Black RTV. After letting the RTV set up for a minute or two, I reinstalled the cover and tightened the bolts in a crisscross manner. Janice refilled the diff with gear oil and the tube of friction modifier. I later pulled the ZJ axles and looked at how to remove the tone rings. My bearing puller was not long enough to reach. I knew I could use my Dad’s press but I did not want to make the drive to his house. I did some research on the internet and found a forum post that suggested that the rings would come off easily if heated. Since it was very cold out, I decided it would be a good time to try. The forum post had indicated that the tone ring was aluminum so I was being very careful not to crack it. I put the axle shaft in the vise and began heating the ring with my acetylene torch. Soon I was able to pry the ring of the seat. I dropped it on the floor to cool. I noticed that it did not sound like aluminum. I took a magnet to it and found it was indeed magnetic. That made sense to me since the tone ring is used to generate a magnetic field for the sensor to rear the wheel speed. It had to be steel. I was more aggressive with the heat on the second one and it slid off easily without any prying. These shafts had no visible wear on the bearing races and look like they will make fine replacements. I just have to get more gear oil and another bearing and then find time to do the job again. UPDATE: I have the spare axle shafts ready to go in but so far the old axles are running quietly. I will just let them run for a while.